Provide comfort for the family of Stella Brown with a meaningful gesture of sympathy. Stella S. Brown, bound for Glory, 93 of Dryden NY died March 13, 2019 at the Cayuga Medical Center in Ithaca. Born May 11, 1925 in Virgil, NY, she was the daughter of the late Frank and Elva Burvee Sycuske. Stella had graduated from McGraw Central School and had been a Branch Manager at the 1st National Bank of Cortland. She had also enjoyed after that working for Dean Brown Real Estate and later Century 21 The Harrington Agency. She had always enjoyed gardening and talking to her grandchildren, great grandchildren and family. 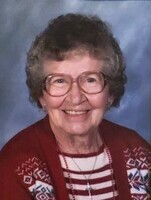 She is survived by her sons, Stanley Harrington of Dryden and Lloyd (Jim) Harrington of Cincinnati, Ohio and numerous grandchildren and great grandchildren, siblings, Franklin Sycuske of McGraw, Jeanette Sycuske of McGraw, Berthena Heath of Idaho, and Celia Benedict of Homer and several nieces and nephews. The family will hold private services at a later date. A memorial group has been established on Facebook to remember and honor Stella as Mother, Wife, Sister and Friend. Search for the Group IN LOVING MEMORY OF STELLA HARRINGTON BROWN.